West Parlor, Mount Vernon, VA. Featured here is a portrait og General Whashington painted by Charles Willson Peale in 1780. 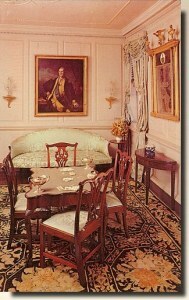 The card table and looking glass are original Mount Vernon pieces.